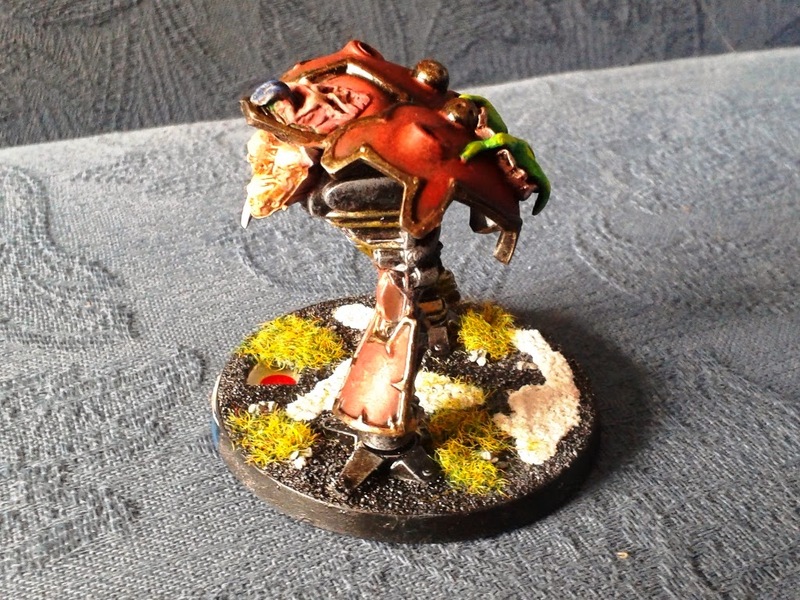 The third in the series about painting Warlord Titans for my Epic Chaos project (See here for the First Titan and Second Titan). This one is my favourite of the three Titans, I think. I like the impression of movement that the hair strands on the head, coupled with the tabard thingy dangling between it's legs gives it. Nearly finished on the Titans now - just the interchangeable weapons to do. 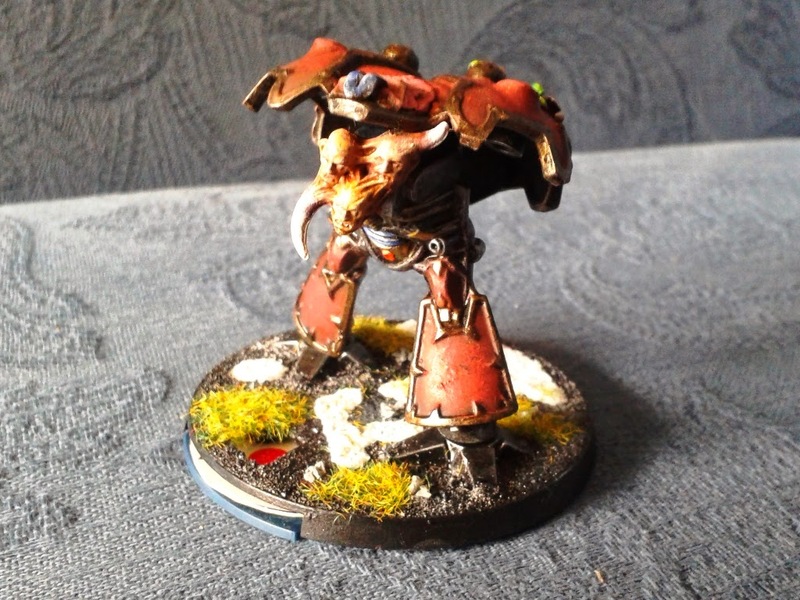 Following on from my previous post about completing the paintwork on my first Titan, here are some pics of the second finished model. Similarly to the first one it's being shown without weapons which I'm still working on. 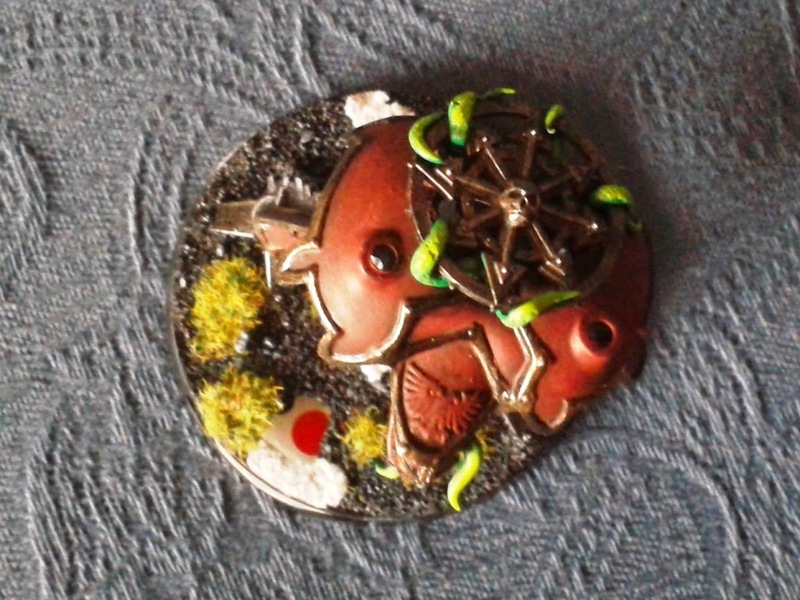 This one took a little longer to finish than the first as it's got more conversion work on it. The eye detail on the right leg caused me some consternation as I couldn't get it painted in a way I was happy with. I'm still not 100% happy with the way it is now, but it'll do. 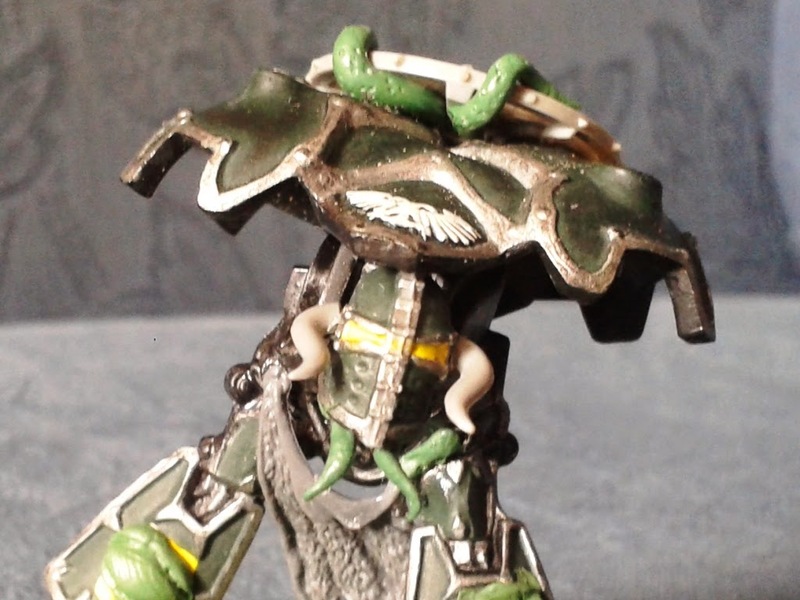 I'm particularly fond of the tentacles I sculpted for the carapace on this model. 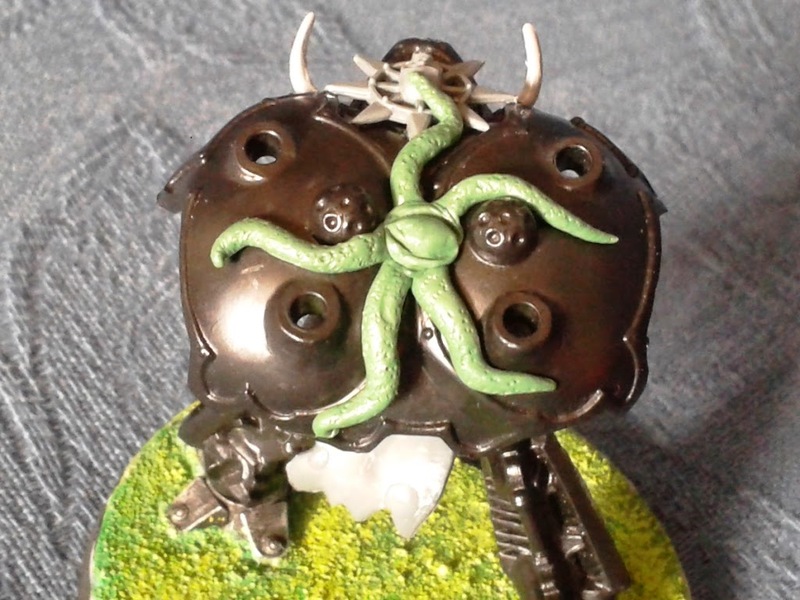 My biggest issue with this model is the fragility of the tentacles on it's head - you can see here that one (upper left) has broken off. Again. 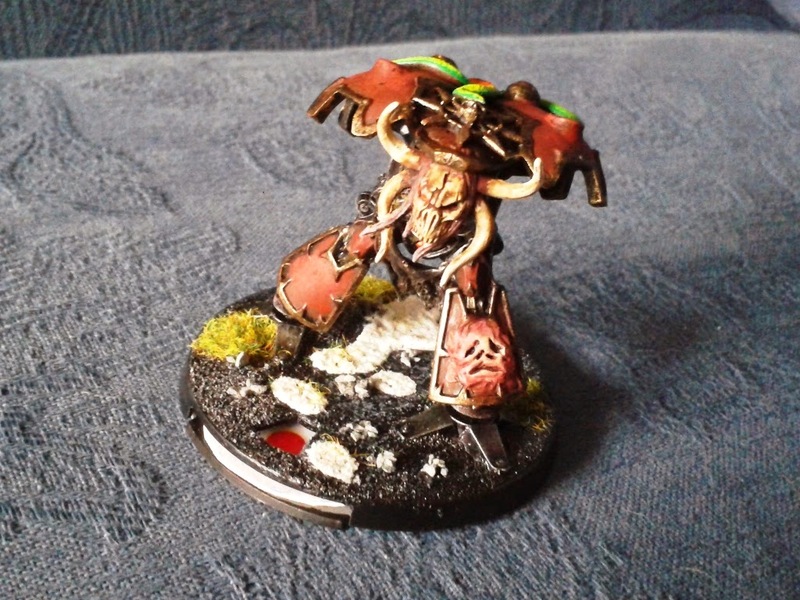 Here is the First of my three Warlord Titans all painted up. I'm really pleased with how this has turned out - I wasn't quite sure where I was headed with it once I got past the "spray it black" bit. 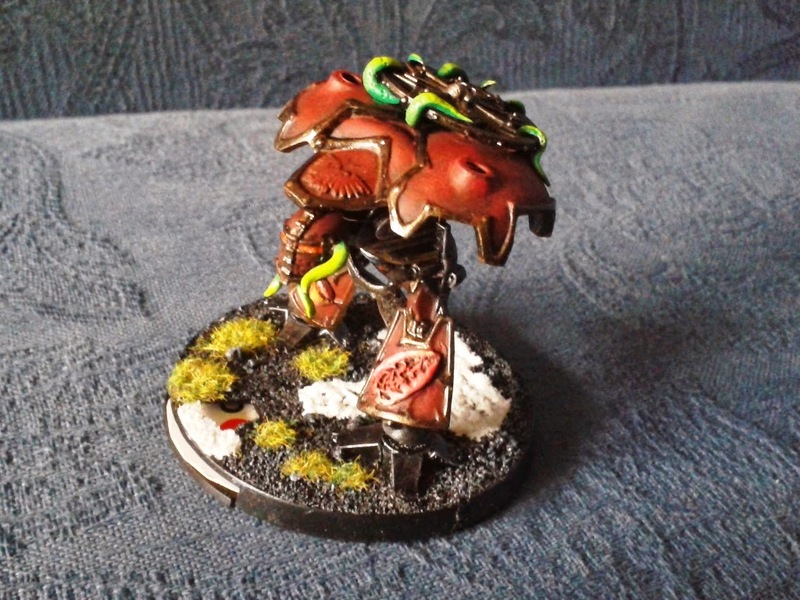 I've actually ended up with a colour scheme almost identical to the one that was used on my Warhammer Warriors of Chaos army. This was completely accidental - it's just kind of "where the paint led me". ...I'm very happy with them! 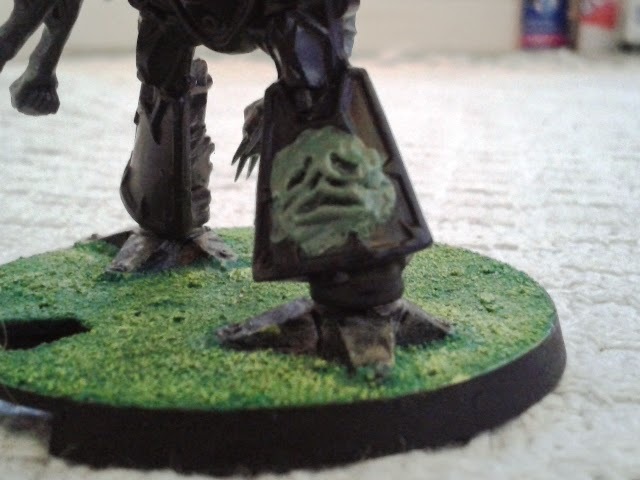 A daemonic face (blowing a raspberry). 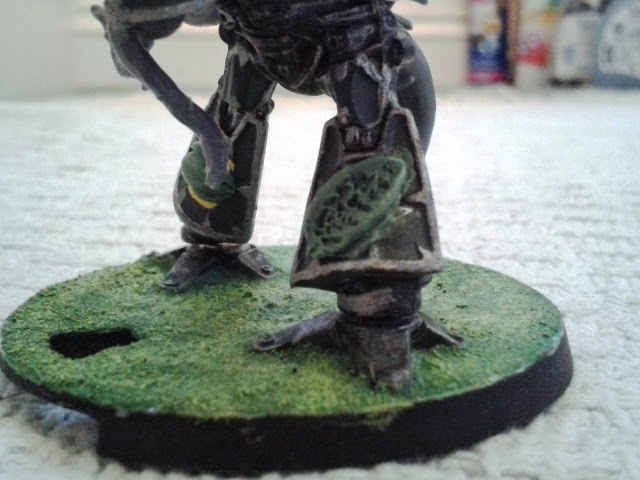 I'm totally chuffed with how the greenstuff went. Obviously you can tell from these photos that this guy is (literally) unarmed at the moment. 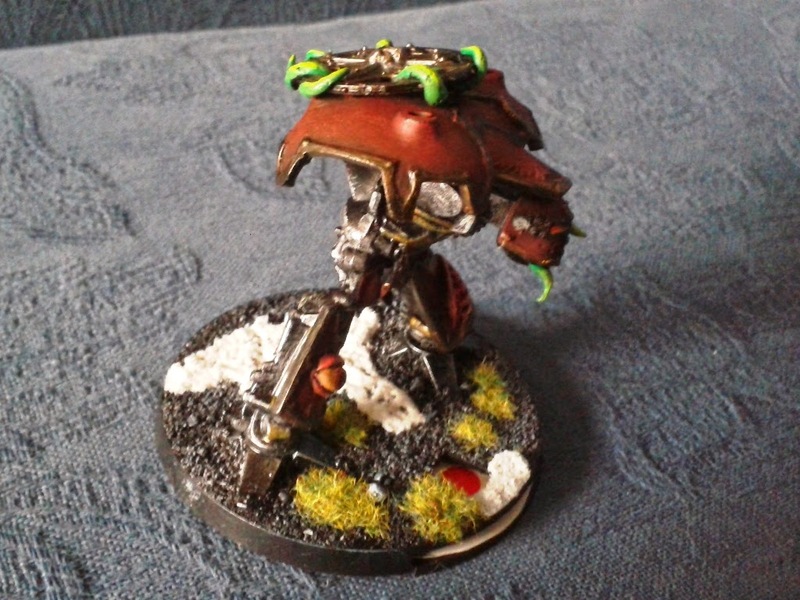 The weapons and tails and suchlike are something I'll turn my attention to once the other two Warlords are painted. 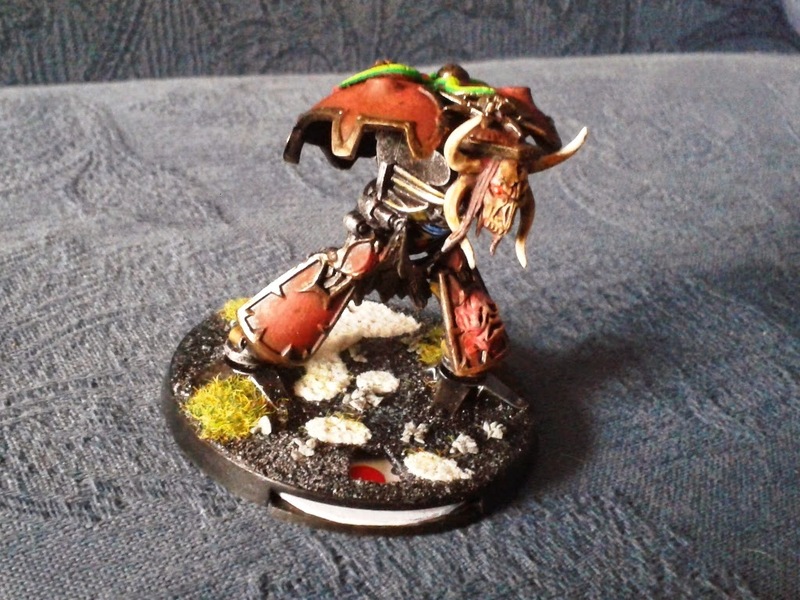 The final part of the "construction phase" of my Epic scale Chaos Warlords is complete. 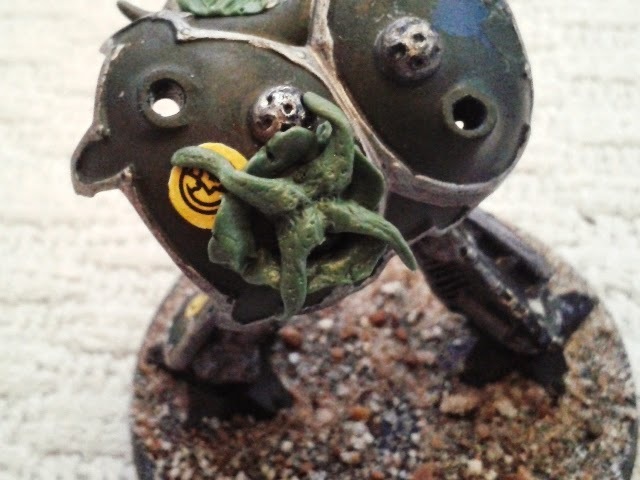 In my previous post I mentioned how much I'd enjoyed working with the Green Stuff and that I was planning to add some more to the models. Well, I've added a couple of Chaos widgets from my bitzbox and a little more green stuff finished them off nicely. 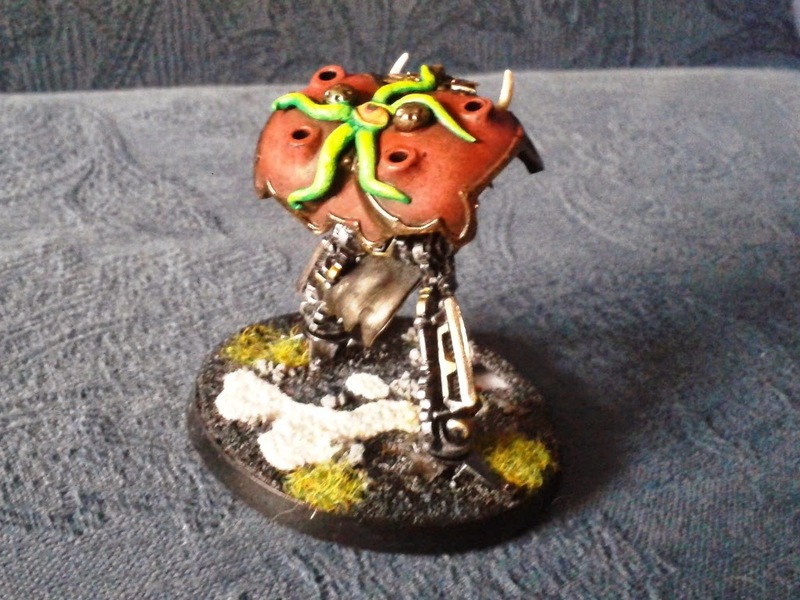 ...and an eyeball with tentacles to his Carapace! 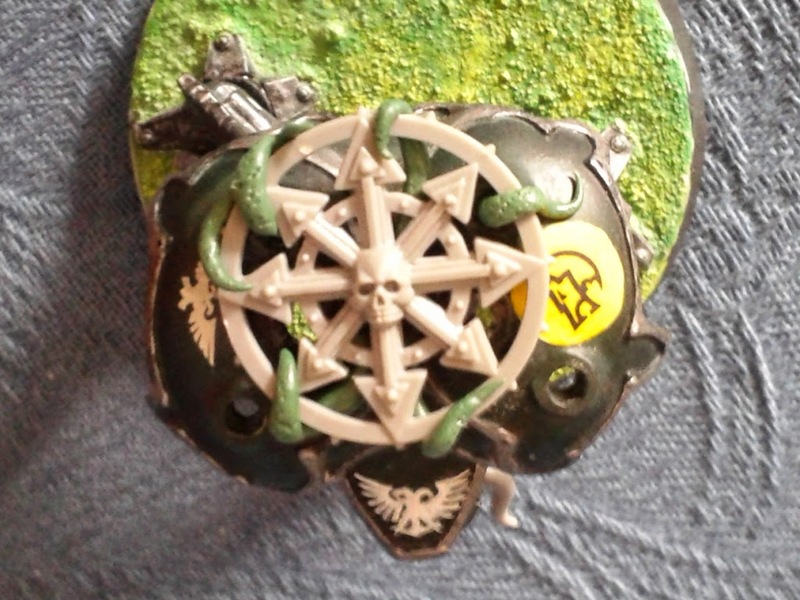 ...and a big Chaos icon (actually a Chaos Warrior standard top) on his carapace, held down by tentacles. 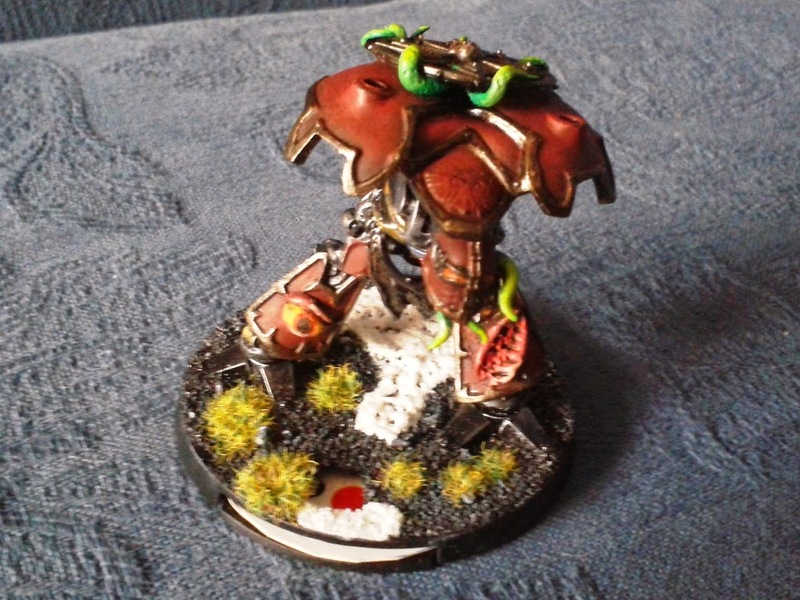 Next in the process of getting my Titans ready for the table comes the part I'm most nervous about - adding Chaosy details with Green Stuff. I'm no sculptor. Any successes I have had so far have tended to be with Milliput. 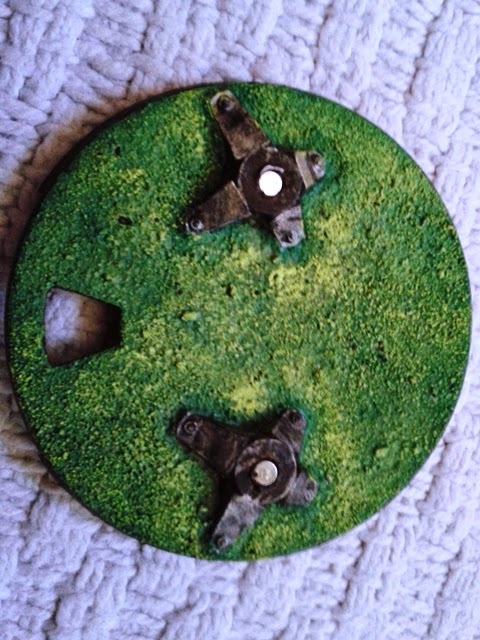 I've always found Green Stuff hard to work with - it seems to constantly stick to my tools and work surface, no matter how wet I make things. 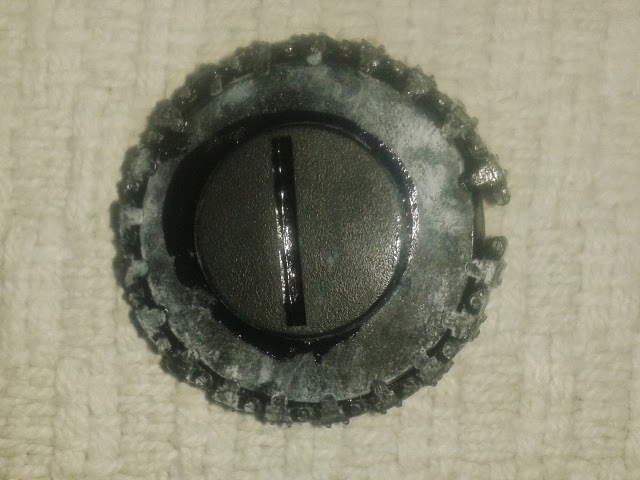 I was determined to give it another go, though, as I like the fact that when it's cured it's still got a pliable plastickyness to it which makes it less prone to snapping and abrasion. So I got stuck in and for some reason, it all went better this time. I don't know why - it just did. I really enjoyed myself! 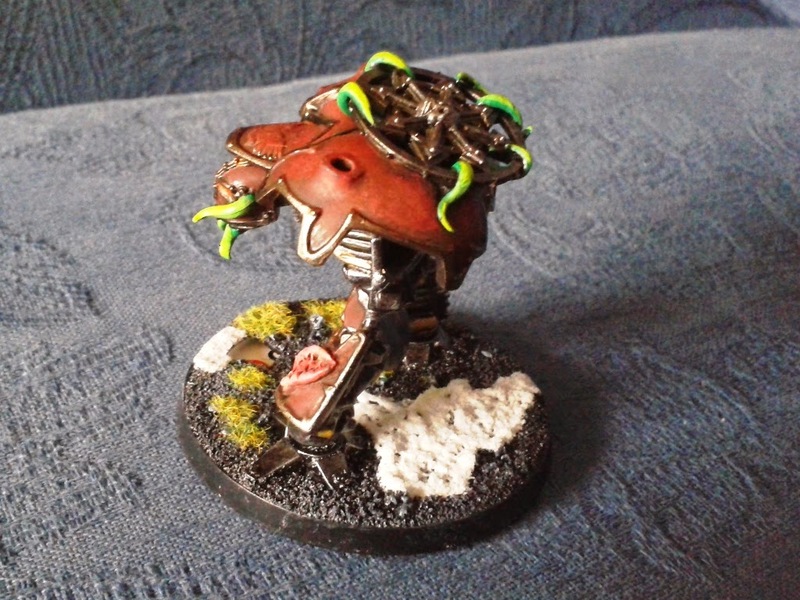 ...and then I decided to see if I could model some tentacles bursting out through the carapace. 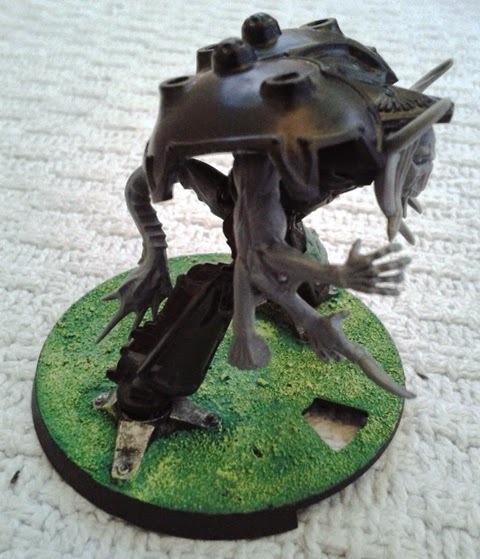 That's obstructed a weapon mount-point, but they're in plentiful supply on these models anyway. I was so enthused by how the work went, that I got carried away and did more, which I'll show in my next post. 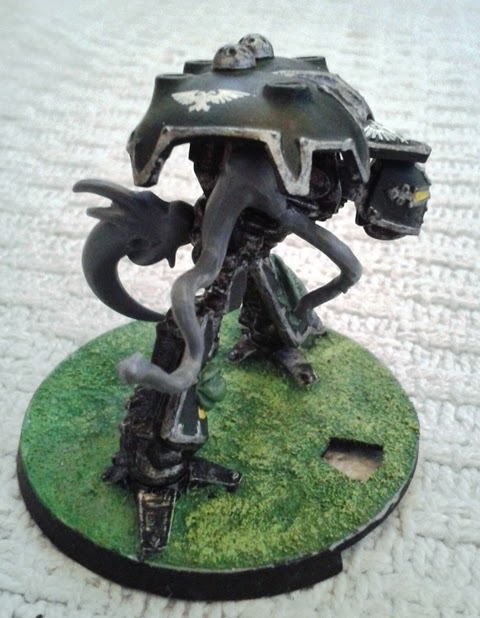 Any good (or Chaotic) Epic-scale army would not be complete without a few Titans strolling around, stomping on tanks and killing folks as though they were germs. Mine is no exception. 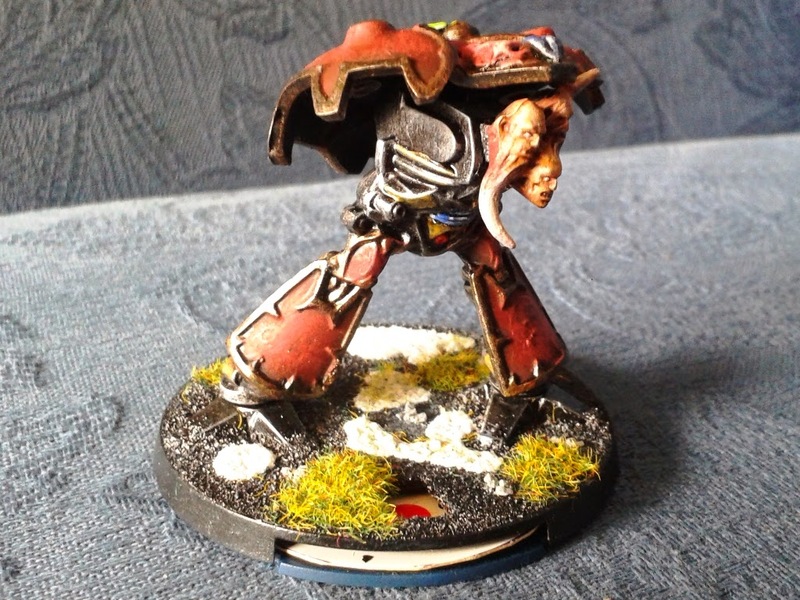 Being someone who likes to game "on the cheap" and also enjoys exercising his minimal modelling skills, I decided to create my Chaos Warlord Titans from some old, broken, Imperial Warlords that I have. For those of you too young to remember, the weakest part of these 20-year-old models was always the ankles. 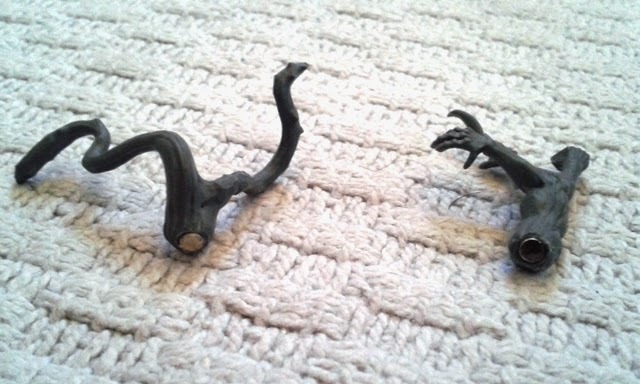 I have about a dozen of these things and at least half of them broke at that point. 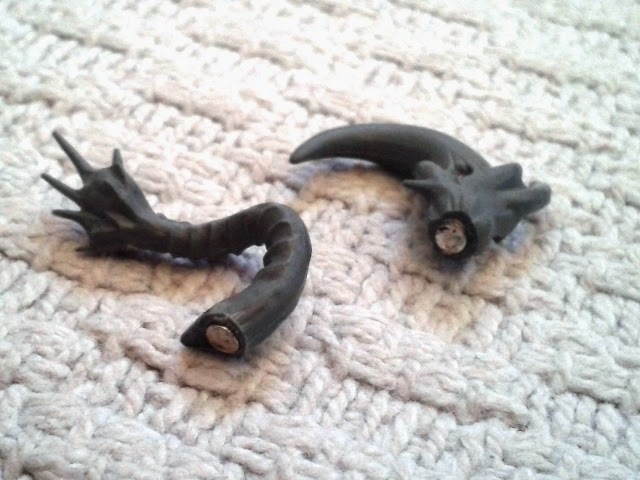 I decided that the easiest thing for both strength and portability was to make use of this "feature", so instead of repairing them, only to break again, I installed magnets so that the main Titan model could be detached from its feet (and the base). this should make packing into a case easier too. 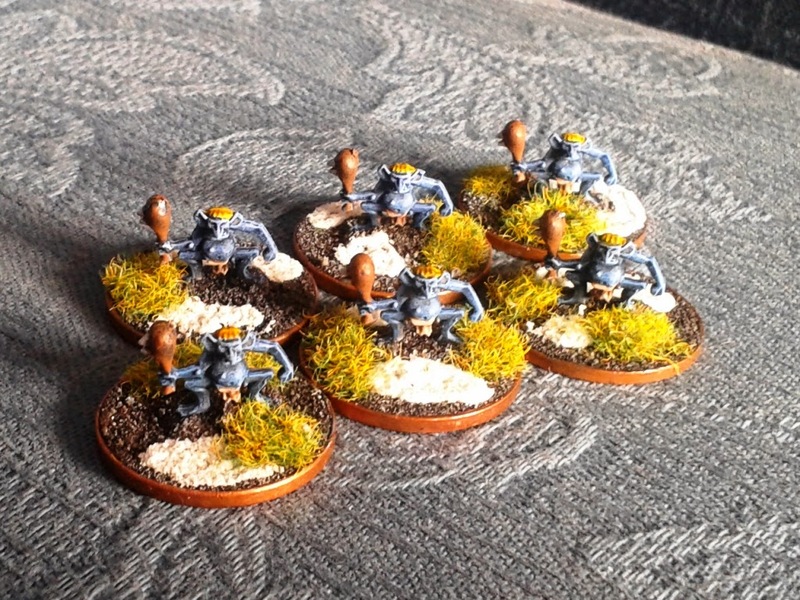 And some in some spare Chaos Spawn tails - job done! 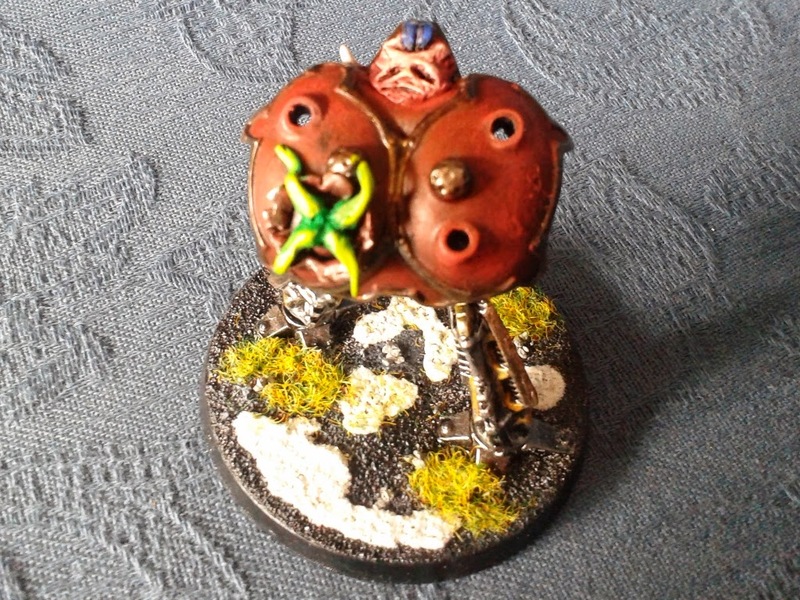 I also decided to Chaos-up the close-combat weapons a bit. 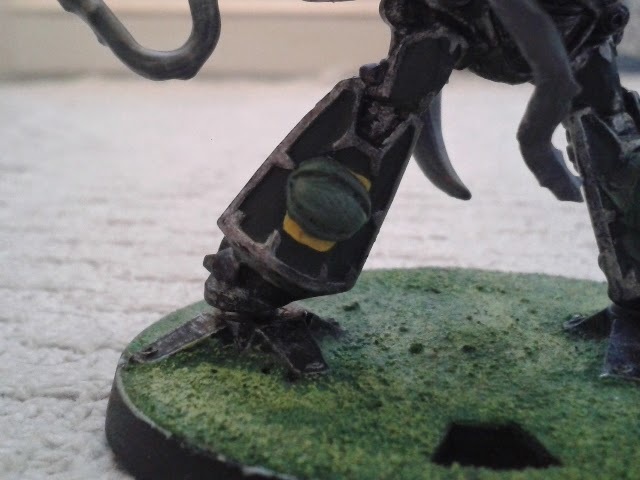 I'm using some old Fantasy Chaos-Spawn spares here to represent the Power-Fist weapon (there are other CC weapons available for Titans, but I'm not that great a modeller that I can come up with a variant for all of them). 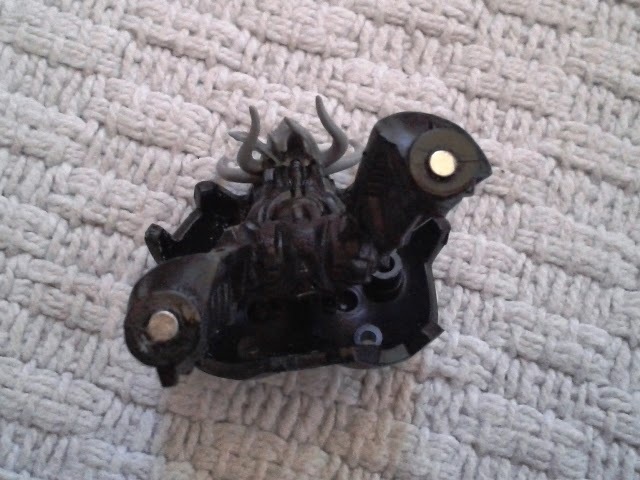 These are magnetised to attach to a magnet placed inside the carapace. 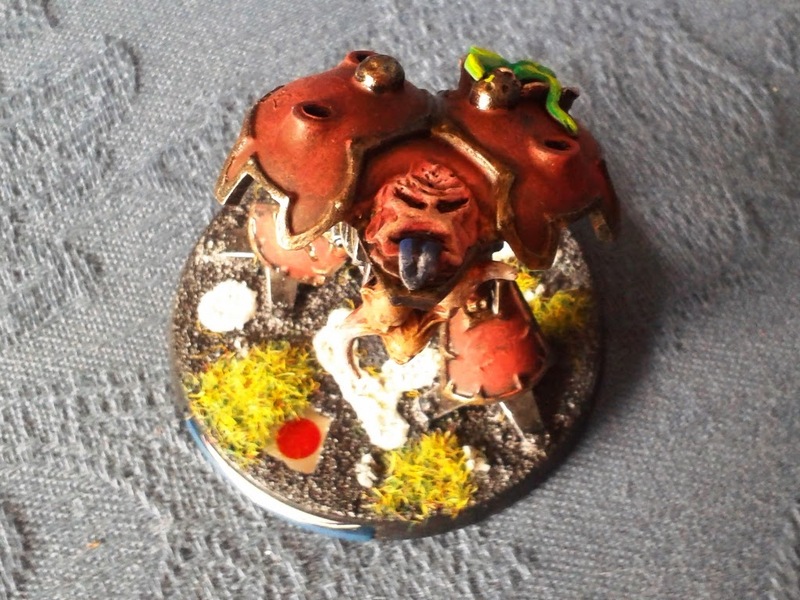 In order to still be able to attach other weapons should I want to, I magnetised the little adapter widgets (which I forgot to photograph) which normally push-fit into the hole in the carapace that now contains a magnet so I can still mount regular weapons too. And this is what I've got so far - I've actually got three Titans I'm working on but these two pics should give the gist of what I'm getting from the magnets. 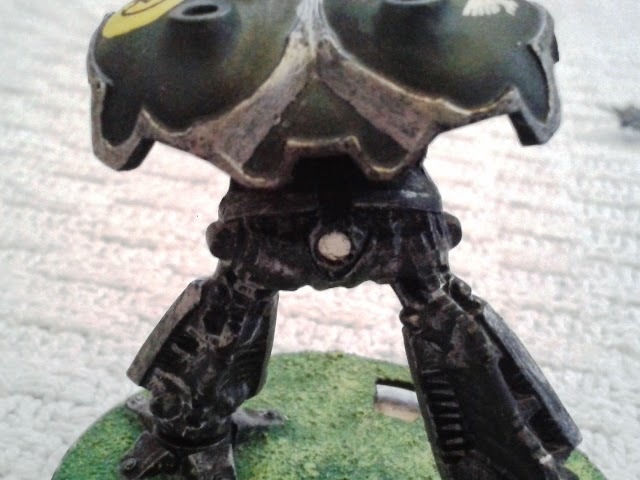 Please ignore the paintjobs on these as they are going to be over-painted - where paint can be seen it's years old and represents these Titans in their original battlefield role as Imperial, not Chaos Titans. 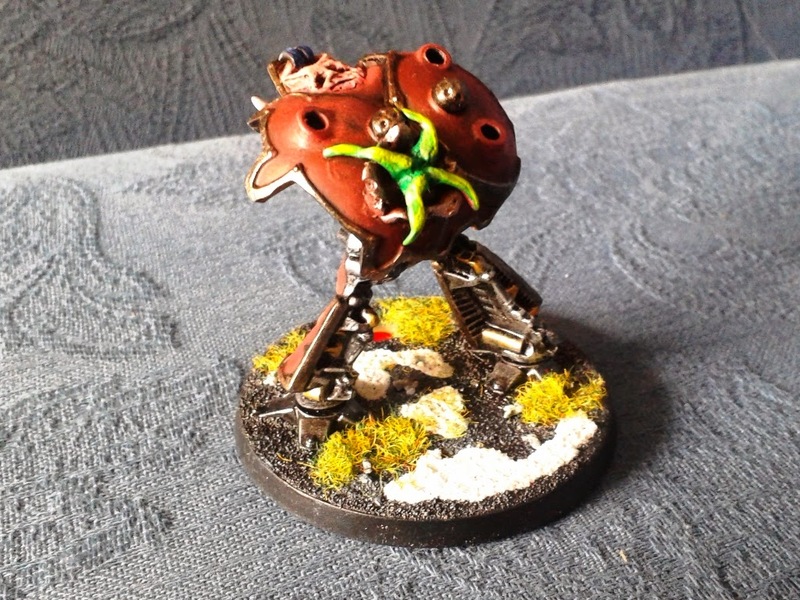 In my next post or two I'm planning to get busy with some customisations courtesy of some more items from my bits-box and some greenstuff. 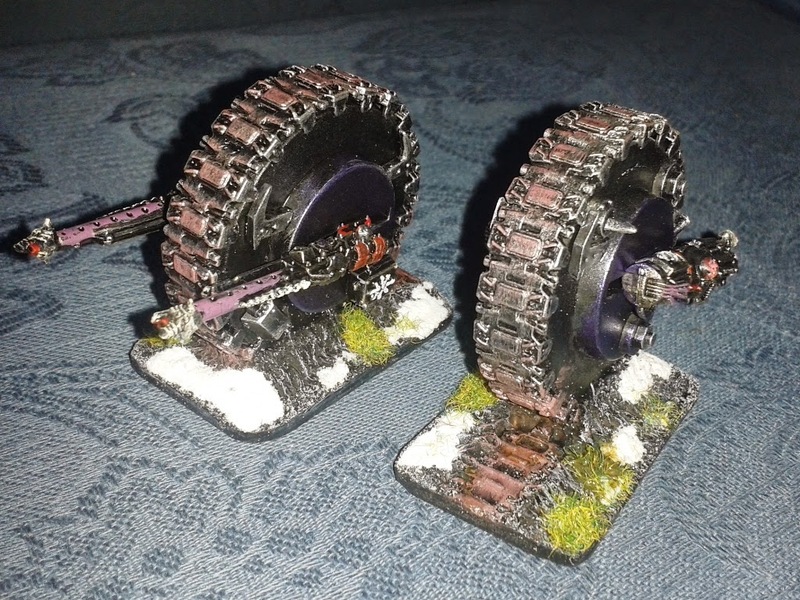 Following on from my previous post about building these Death Wheel models, I've painted them up and I think they're looking fairly good, for something that's made out of slottabases and scraps! I think it must be time to start working on a Titan or two. 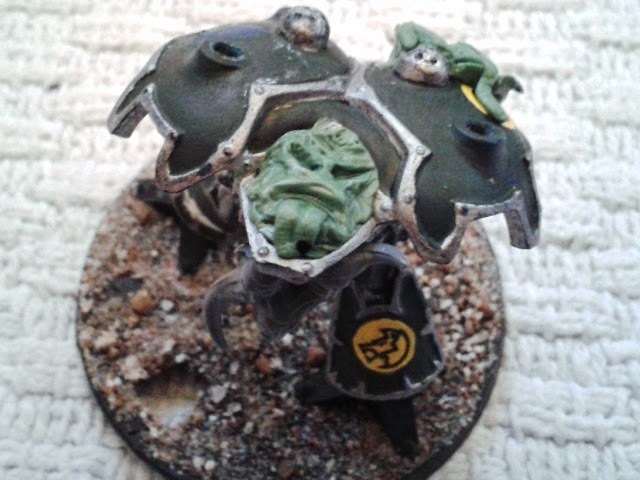 I have a bunch of old, broken Imperial Warlord Titans which I'll start conversion work on shortly. Stay tuned. 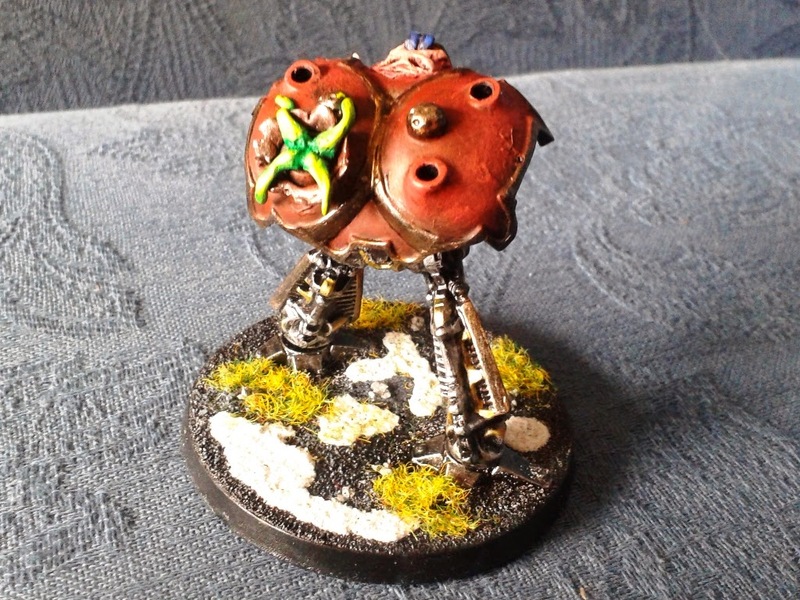 These models are a complete kit-bash from bits of scrap. The fact that the track doesn't meet up on the right of the photo is irrelevant as that's going to be the bottom of the model and will be obscured by the base. Very simple and very, very easy to build. I'll follow up this post with another in a short while to show them painted. 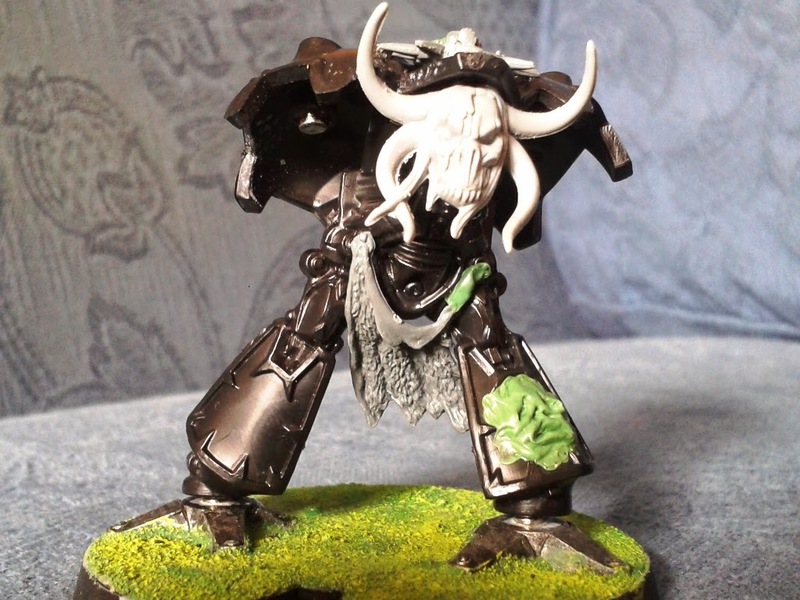 Here are the final two detachments of Minotaurs to accompany my Chaos Marines. 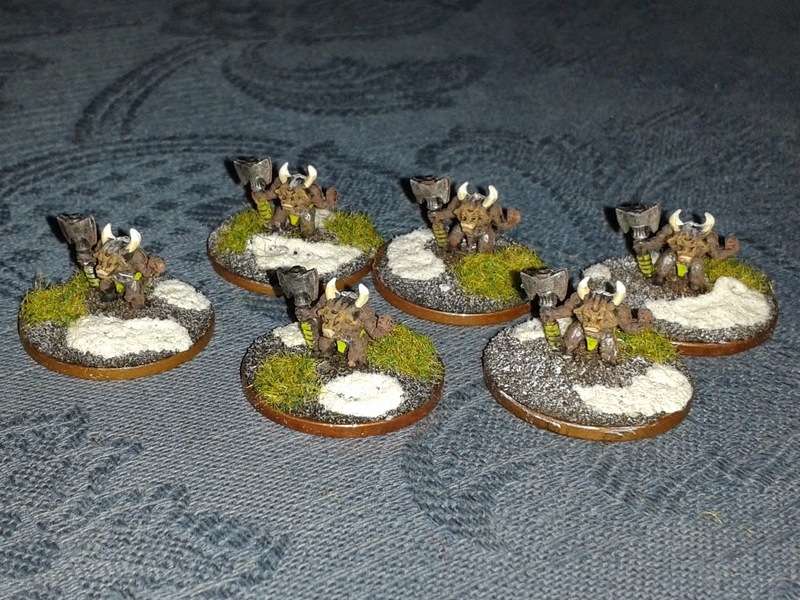 They will most likely be fielded as part of a "Daemonic Company" alongside my Trolls. 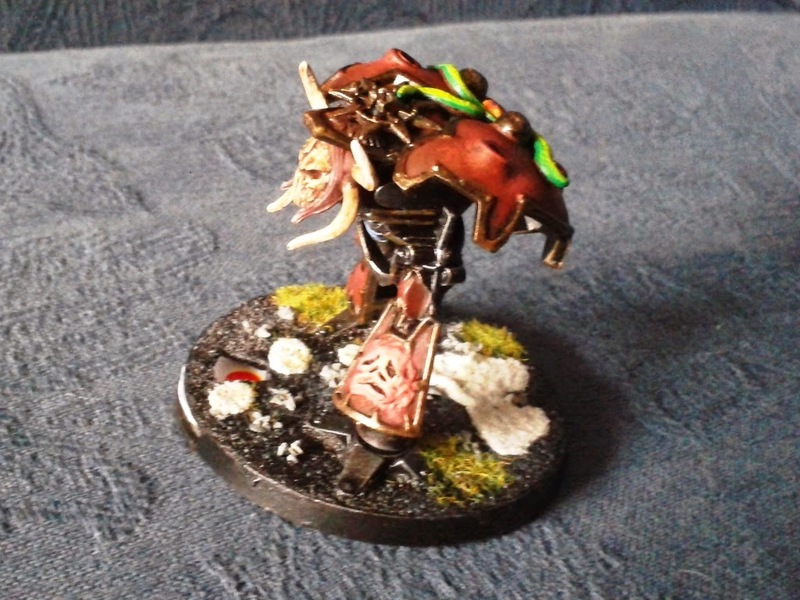 Quite why Minotaurs and Trolls make up a Daemonic Company is beyond me, but I don't write the rules. 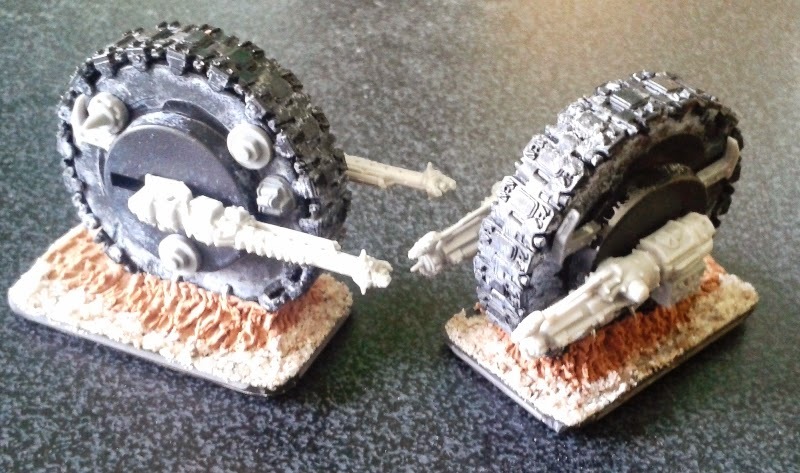 In my next post, I'll show some of the work I've been doing to kitbash some Death Wheels. 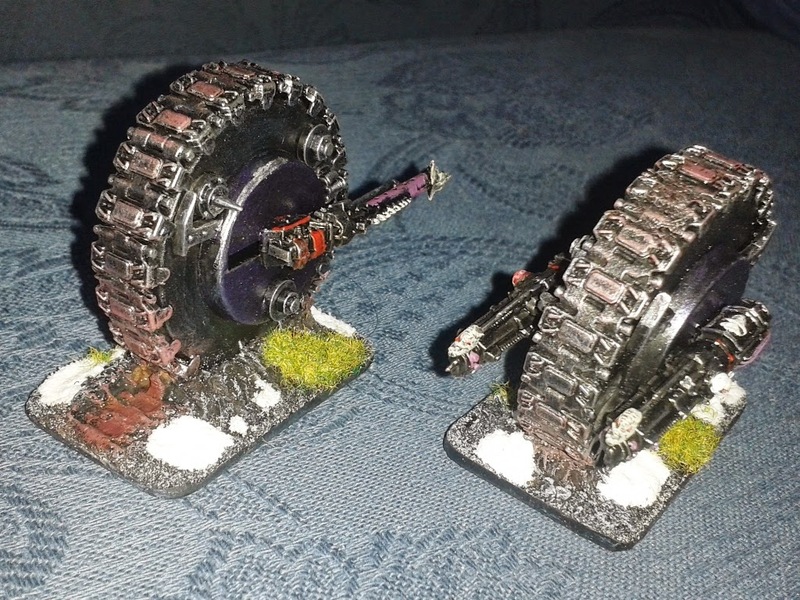 Here we go with another couple of units to add to my growing Epic: Chaos Marines force. 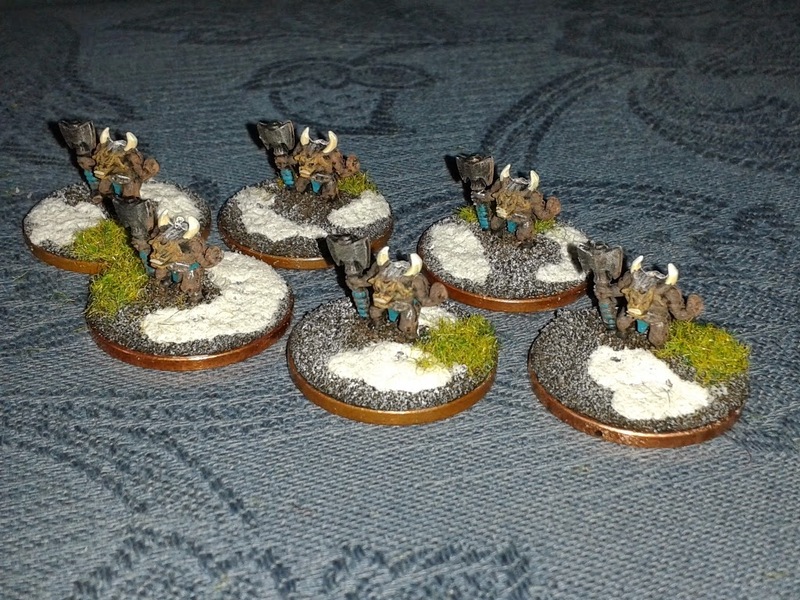 This time it's the turn of the Minotaurs. And the answer to "spot the deliberate mistake"? I forgot to paint his loin-cloth. Now corrected. 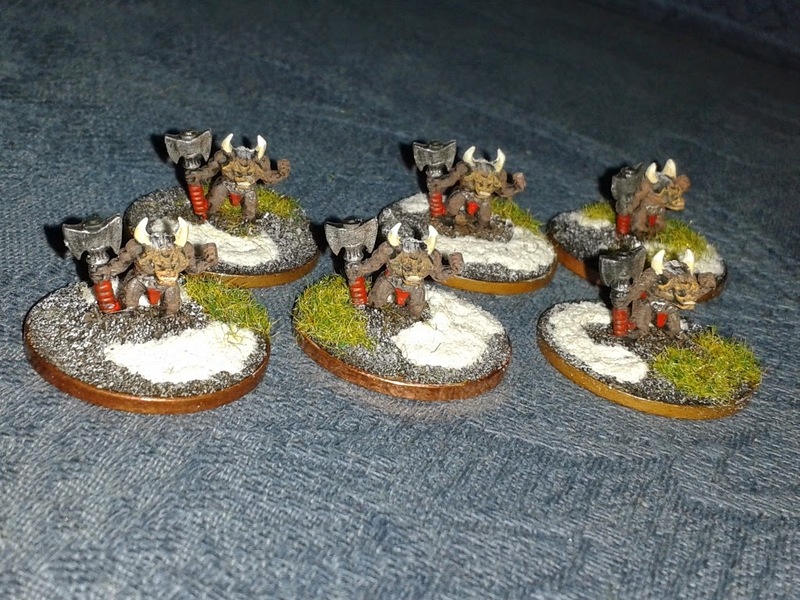 Here is the second of my two detachments of Trolls. I'm now officially nearer the end of this project than I am to the beginning. 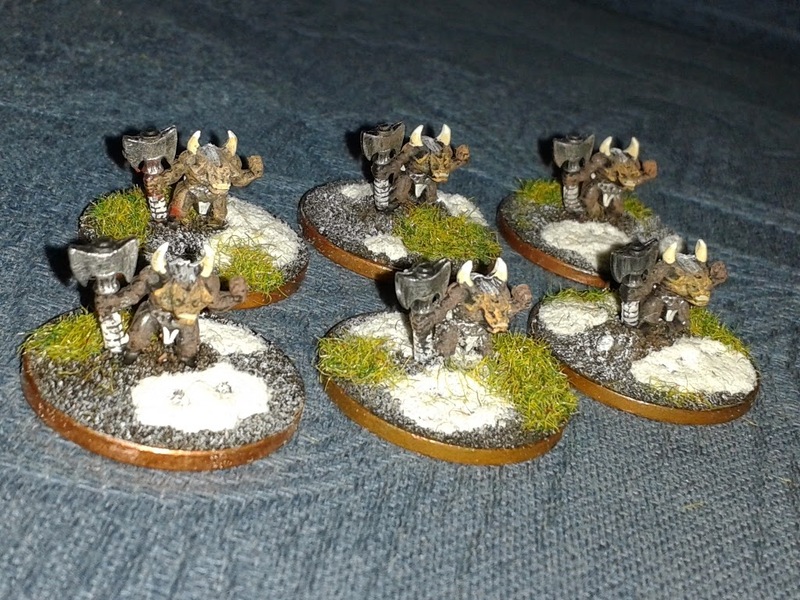 I only have some Havoks (Devastators), Commanders (all painted, just need basing), Minotaurs (all painted, just need basing) and Beastmen left to complete all my infantry. 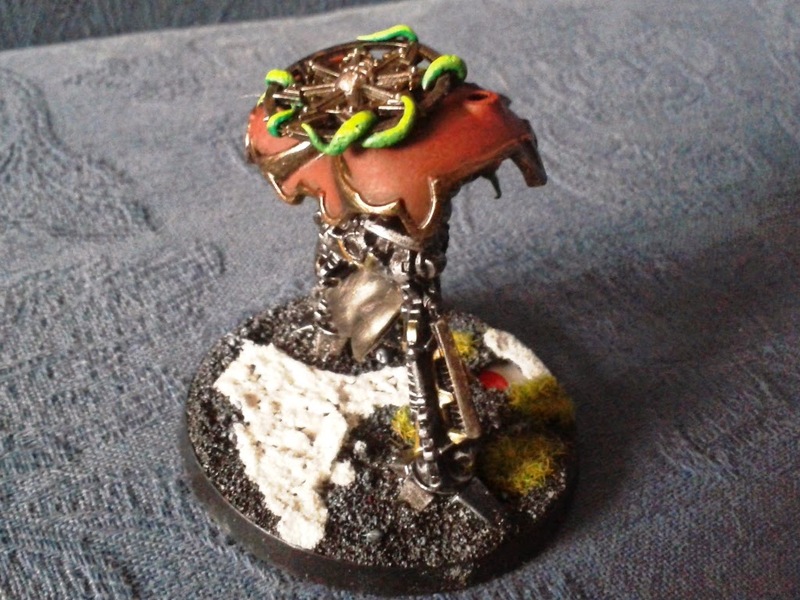 Then there are some odd Khorne tank-wotists, Titans and Death Wheels to do to finish all this off. 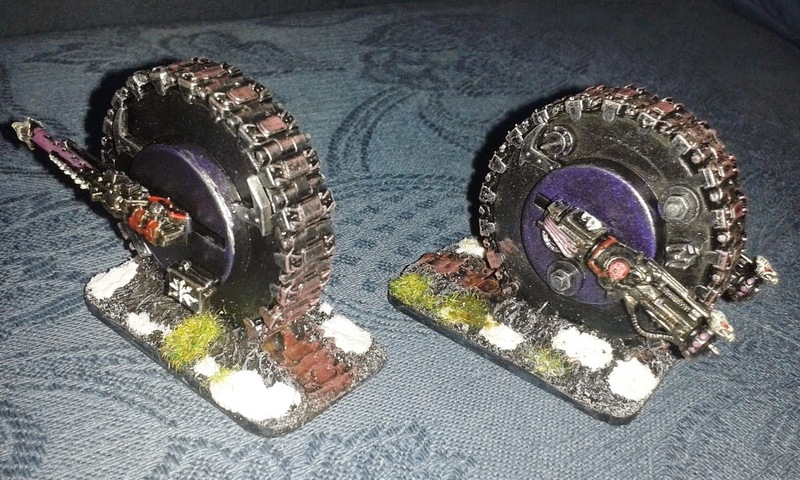 My plan is to finish the Minotaurs over the weekend, then get cracking on the Death Wheels which will be a scratch-build. 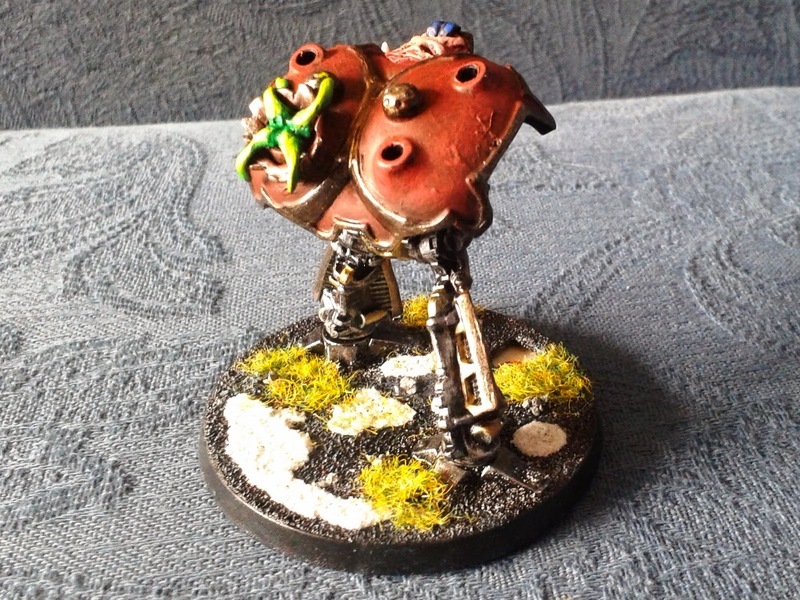 Titans will get left until last - I want to do some converting there and am still thinking my way through it. 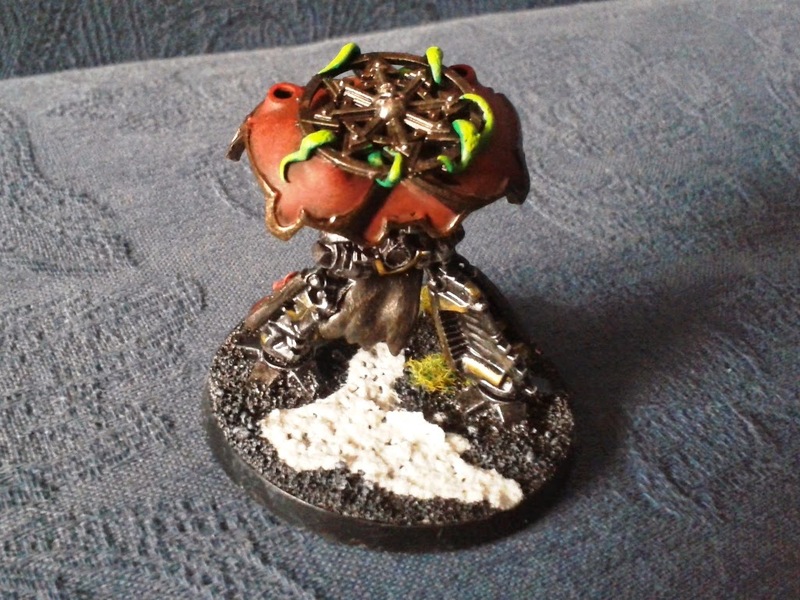 Here we go with a couple of detachments of Whirlwinds for my growing Epic Chaos Marine force. My second can of spray was faulty and dribbled paint from underneath the nozzle all over my patio whilst I sprayed - I only noticed when I felt my hand was cold and wet and looked to find my fingers (and shoes!) were covered in black paint. My drybrushed purple just wouldn't go on for some reason - it took about 6 layers to get to the finish you can see in the photo. When doing the Rhinos and Landraiders earlier in the project I did it in one layer. 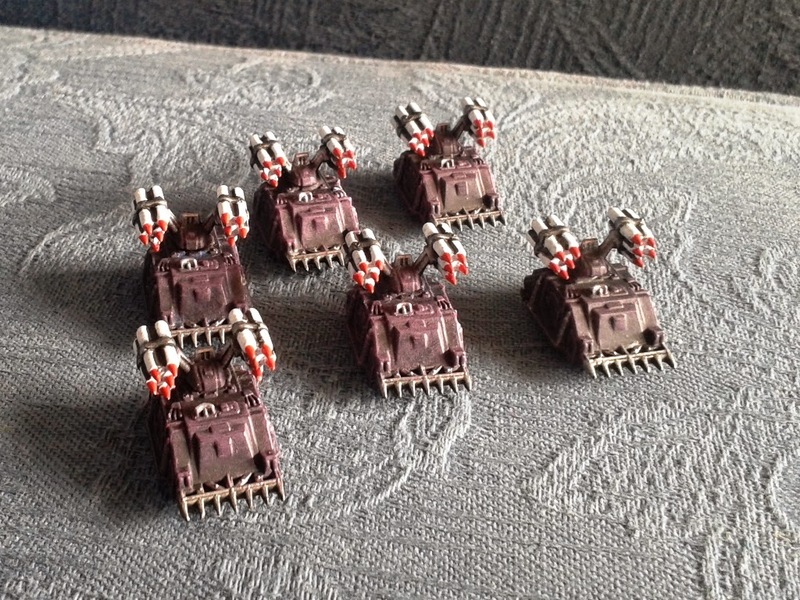 I then had a nightmare painting the white paint on the missiles - just couldn't get an even finish. In the end I gave up with a "these'll do".